Fantasy evaluations are based on the player’s statistical projections, no matter what type of league you are in. A key to winning fantasy drafts is to find which players will exceed their projections and then go get them as cheaply as possible. 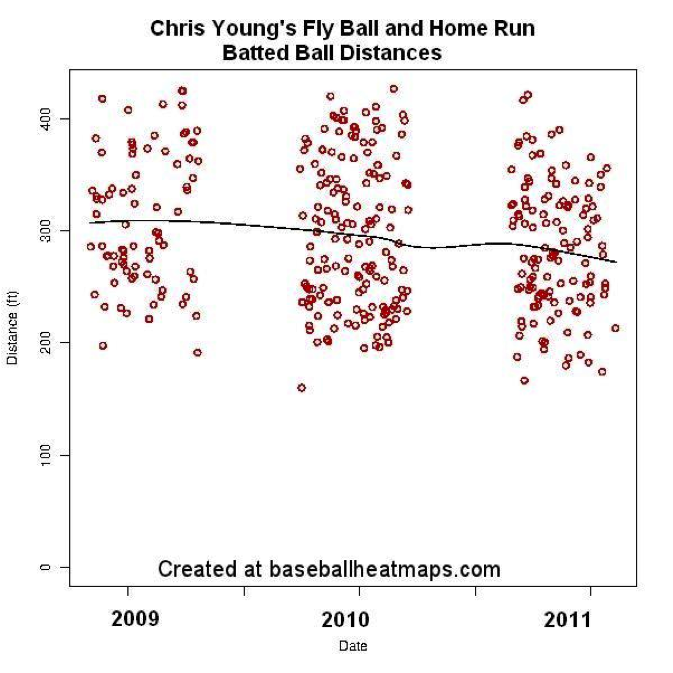 It also follows that hitters that played through injuries the year before could outperform their projections. One problem with projections is that they take into account the player’s full season of production. If a player persevered through an injury during the season, their overall stats probably suffered. Projections don’t know if a player played through injuries, though. The player’s projections might have been better if the player had simply gone on the disabled list to recover instead of trying to play through pain. An example of a player playing through injuries in 2010 was Ben Zobrist. He suffered a back injury in late July and missed only six games. Then he played through the rest of the season. Here are his triple slash lines before and after the injury. His batting average was about the same in both projections, but the original projection had a better prediction of on-base percentage while the adjusted one did better with slugging percentage. One example is not enough of a sample size to draw any kind of conclusion, so it was time to crowdsource on the interwebs for players that were hurt and played though an injury in 2010 or earlier. For our sample it would be best if the injury had been a one-time fluke and not a yearly reoccurring injury that would affect the player’s stats from year to year (see Chipper Jones). I ended up with 10 hitters from 2009 (Brandon Inge, Vernon Wells, Kevin Kouzmanoff, Geovany Soto, Mike Napoli, Jimmy Rollins, Jacoby Ellsbury, Luke Scott, Edgar Renteria, Alex Rios, Chris Young) and 2010 (J.J. Hardy, Brian McCann, Andre Ethier, Mark Reynolds, Carlos Pena, Ian Kinsler, Ben Zobrist, Scott Rolen, Raul Ibanez, Mark Teixeira). I matched up each pair of years and compared their AVG, OBP, SLG, isolated slugging percentage and home runs per plate appearance numbers. I regressed each player’s stats to the harmonic mean of their plate appearances. Finally I and compared the change in stats from the projection to their actual results. The final numbers show that the players that play through the injuries don’t really see a next-year drop in their AVG or OBP compared to their projections. This same group of players does see a nice jump in power numbers though. Looking just at the HR/PA, the value works out to be three home runs over the course of 650 PA. While the numbers don’t show a huge discrepancy between the actual and projected stats, the players, on average, show a measurable increase in power over their projections. With this information, here are some players that played through injuries in 2011 and may exceed their projections in 2012. I have included the average draft position (ADP) for the player in 2011 (ESPN drafts) and 2012 (Mock Draft Central) to show how the injury has affected the player’s draft stock. It might make sense to have a different draft/auction approach with him depending on the type of league. In a keeper league, I would value him as if 2011 never happened and take him in the first 40 picks. You can’t let a young talent like Heyward pass through your fingers. If he fails, so be it. If he thrives, you will have a nice keeper. In a one-year redraft league, you can’t take as much of a chance that he will be 100% healthy. I would probably split the difference between his 2010 and 2011 ADP and draft him around the 80th pick. Chris may not be able to put up numbers like he did in the first half of the season, but I do expect a decent season from him. Drafting him near the 90th spot seems reasonable. David’s 2012 draft value should be based more on his production after returning from the DL. With the lack of talent at third base, a top 20 pick is not out of the question. 2012 was a mess of a season for Adam Dunn. It may have all started when he had his appendix removed just after the start of the season. There is no way the surgery caused the entire season collapse, but it could have started the downward trend. Historically, players have taken a little over 30 days to return from an appendectomy. Adam only missed a week, and the early return could have changed his approach and/or confidence. Adam still has a good chance to be a productive player in 2012. It may be tough to start him, but he should at least be drafted for the chance of a turnaround. As with so many other players in the sample, Ethier’s AVG and OBP remained constant, but the power numbers dropped. He has undergone surgery on the knee and should be 100% ready for the start of 2012, at least by his own reports. Plan on drafting him in the top 100 players. Playing through an injury is nothing new in baseball: nobody wants to lose their starting position or disappoint their teammates. This chivalry is all nice and dandy, but we are talking about serious stuff here — fantasy ball. It’s important to have an understanding of the player’s true talent separate from his injury-riddled production. Finding players that played through injury can help you find an under-valued asset, since these hitters will hit for more power on average than they there were projected to produce. Buy low on a few of these hitters and you might just get a leg up on the competition. We hoped you liked reading Projections and Playing Through Pain by Jeff Zimmerman!